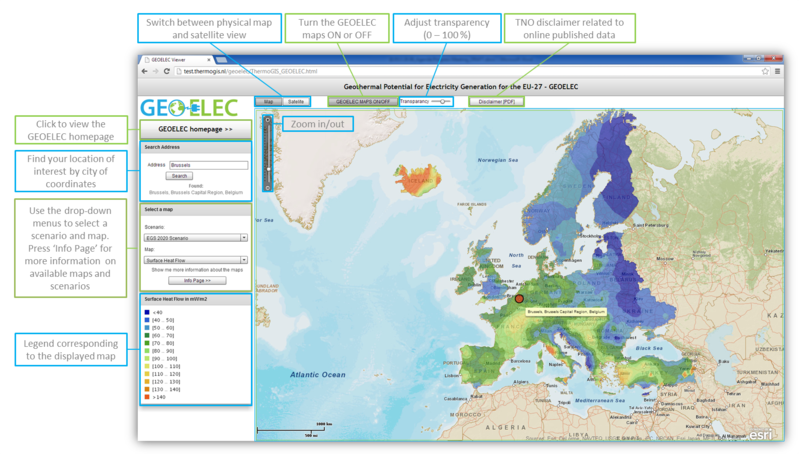 Based on currently available information, the GEOELEC Geographical Information System presents for the first time ever a geothermal resource assessment from 1km to 5km depth. 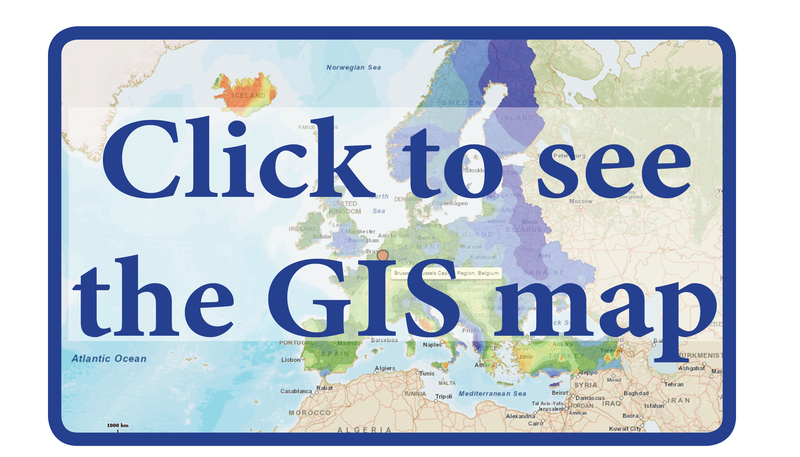 The web service shows the estimated potential for geothermal electricity production in 2020 and 2050 in each of the EU-28 Member States, plus Norway, Iceland, Switzerland, and Turkey. The guidelines below explain the different functions of the system. The methodology of resource assessment has been described in Van Wees et al., 2012The resource assessment has been performed on a regular 3D hexahedral grid with a horizontal resolution of 20 km and a vertical resolution of 250m. The areas covered by this voxet covers the EU-28 countries including various other countries in Europe. For each sub volume theoretical to practical potential is calculated, schematically illustrated in the figure below. These calculations are performed for each subvolume of the grid. 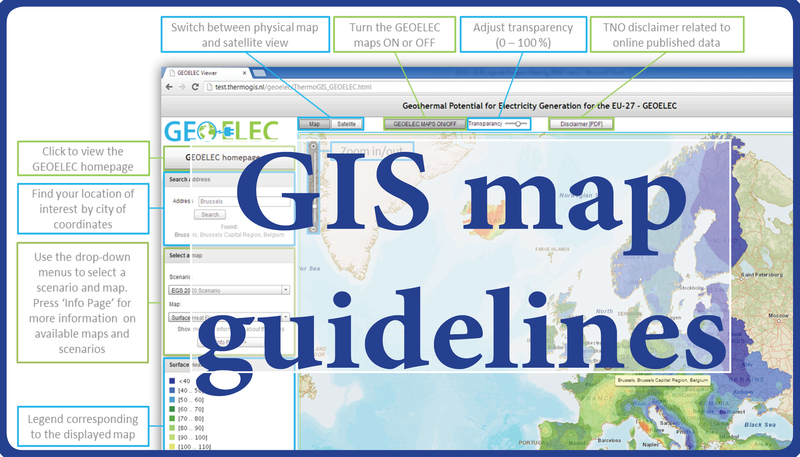 The calculations are detailed below (see calculation of potential maps). Figure: schematic workflow to go from theoretical potential to realistic technical potential. The maps have been calculated for two scenarios. For these scenarios the maximum depth and techno-economic parameters differ. 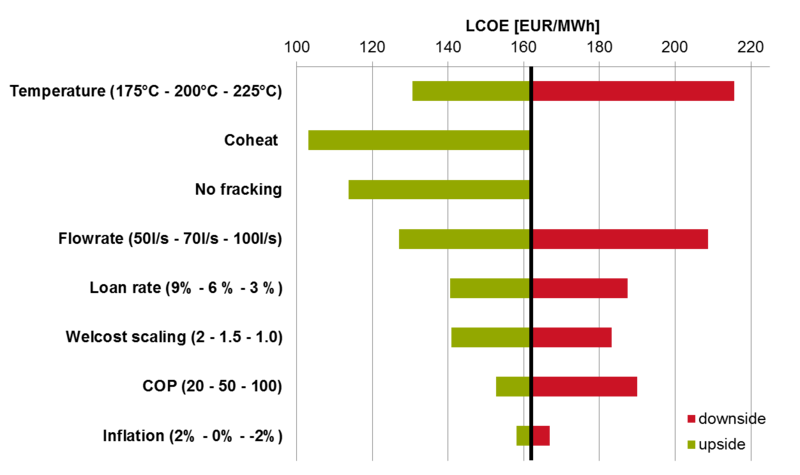 Economic spreadsheets underlying these scenarios can be found here. Figure: sensitivities of predicted LCOE to input parameters for the 2020 scenario at a potential EGS location at 5 km depth with forecasted resource temperature of 200C. The potential calculations take as input a newly constructed model of subsurface temperatures up to 10 km depth. The methodology for constructing these temperatures has been described in Limberger and Van Wees (2013). The adopted model in GEOELEC corresponds to their model C.
Where H takes into account the fact that energy cannot be utilized up till the surface temperature. Therefore a return temperature Tr is used, which equals the previously mentioned cut-off production temperature for the application. For heat production Tr is significantly lower than for electricity production. TP [MW] = 1.057* TC * R.
and includes available land areas, limited technical ultimate recovery from the reservoir based on recovery of heat from a fracture network (Rf) and limitation of operations as an effect of temperature drawdown (RTD). Globally this can result in a recovery of about 1% of the theoretical capacity (IPPC, 2011). The recovery factor of EGS as performed by Beardsmore et al. (2010) does not delineate the reservoir in depth beyond the threshold temperature. For a volumetric delineation which is based on particular play levels leads and prospects (e.g. an aquifer), the recovery factor is generally much higher in the order of 10-50%, whereas the underlying TC involves a significantly lower amount of rock volume. 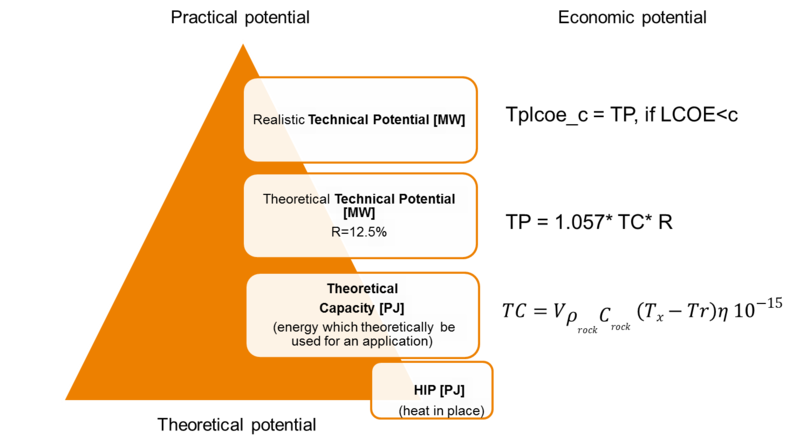 The economic potential (TPlcoe_c) is calculated from the TPreal, accepting only those subvolumes where the levelized cost of energy (LCOE) is less than a given threshold c. The LCOE depend on the application (power, power and co-heat).. The economics takes as input the expected flowrate.